Pebble Mine (Alaska) – How Big? Really Big. Pebble is a proposed open-pit copper/gold mine located in southwest Alaska, near Lake Iliamna, within the watershed of Bristol Bay. Environmental, fishing and sportsmen’s groups are concerned about the impact mining in this region could have on Alaska’s wild salmon fishery, an industry worth $400 million annually to the Alaskan economy. Watch a short trailer for the award-winning documentary film Red Gold, and visit Ground Truth Trekking for maps and photos showing the area where the Pebble mine will be built if the State of Alaska approves the mine. Here at SkyTruth we’ve been doing more work lately to help folks understand the sheer size of the Pebble mine footprint. Construction has not yet been approved by the State of Alaska, and the ultimate plan has not been made public, but we have solid information to help illustrate the likely mining operation: In 2006 the mine owners (Northern Dynasty Minerals) submitted permit applications to the State that show the pit and the locations of two massive impoundments that would hold back billions of cubic yards of mine tailings (a liquified slurry of ground-up ore that has been treated with cyanide and other chemicals to remove the gold, copper and other marketable metals) and reactive wasterock (non-ore-bearing rock that had to be blasted out of the way so they could get to the ore; minerals in this fresh, unweathered rock react with rainwater to form acidic runoff which, if not effectively contained, destroys streams and lakes). These tailings need to be contained – forever – to avoid damaging the downstream environment. But the permit applications only tell part of the story, grossly underrepresenting the amount of tailings and waste rock that would be generated if public statements made by Northern Dynasty about the economically recoverable resource – 10.78 billion metric tonnes of ore – are accurate. This recovery scenario would likely involve block-cave underground mining east of the main open pit, and would generate an estimated total of 13.5 billion cubic yards of waste. But the two tailings impoundments shown in the 2006 permit applications can only hold a total of 3.3 billion cubic yards. So where do they plan to put an additional 10.2 billion cubic yards of waste – enough to cover the entire state of Vermont with a foot of tailings? 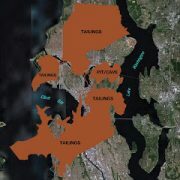 Based on the terrain and locations of other potential disposal sites evaluated by Northern Dynasty and shown in their permit applications, we’ve added two massive impoundments – one 450′ deep, the other 350′ deep – that could accomodate the additional 10.2 billion cubic yards of waste that would be generated. 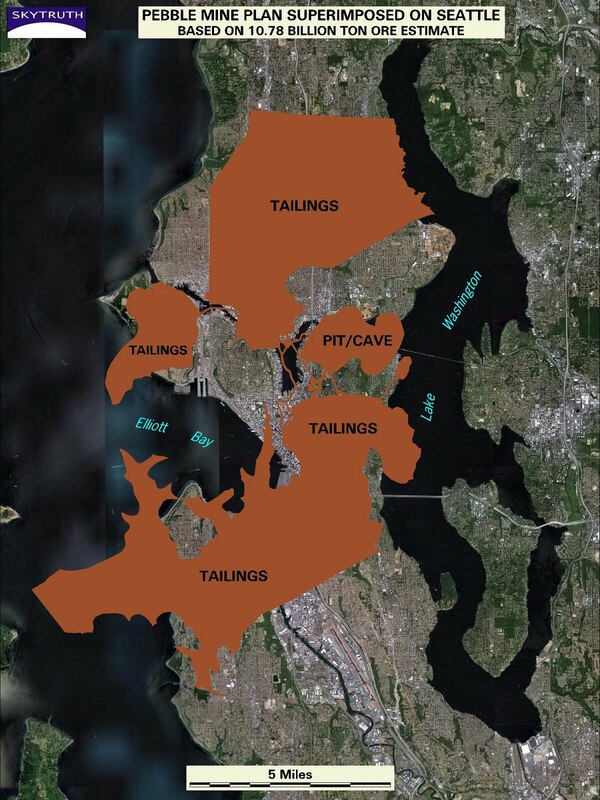 To give you a feel for the sheer size of this potential mining complex, we’ve superimposed this revised plan on Seattle and Anchorage. SkyTruth illustration of potential Pebble mine footprint, based on latest resource estimates, superimposed on Seattle for scale. Fishermen might want to pay attention: Another disposal option, considered and diagrammed by Northern Dynasty in their 2006 permit applications, is to dump the tailings and reactive wasterock directly into Lake Iliamna (Figure 4.2, Intial Site Selection Studies – Deep Water Disposal Option). The mining industry calls this “subaqueous tailings disposal.” It’s not out of question that if the mine is approved, at some point Northern Dynasty will apply for permission to do just that, so they can avoid the expense of having to build and maintain large additional onshore tailings impoundments. Why hasn’t Northern Dynasty submitted permit applications that can accomodate the total volume of tailings that match the resource estimate they’re touting to investors? That’s a question all Alaskans should be asking. We’re left to speculate that, on the one hand, Northern Dynasty and their big-time international mining partners, Rio Tinto and Anglo American, want to demonstrate to investors that they control a huge ore deposit that will generate billions of dollars in profit; on the other hand, they want to downplay the total size and potential environmental impact of the mine to minimize public opposition and ease their way through the permitting process. We’d certainly like to hear more about their plans. Alaskans deserve to understand the full scope of this mining project should it be approved. See all of our Pebble-related maps and images here. And if you like our work, please give us a hand! https://skytruth.org/wp-content/uploads/2010/03/SkyTruth_pebble_sim_mar10_seattle_resource_estimate.jpg 320 240 John Amos /wp-content/uploads/2016/08/test_logo.png John Amos2010-03-25 14:59:002019-02-27 16:29:09Pebble Mine (Alaska) - How Big? Really Big. 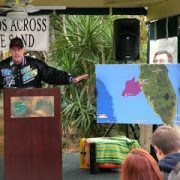 Phil Compton, Sierra Club-Florida, refers to SkyTruth map during press event. Folks concerned about offshore drilling in Florida held an event on February 13 called Hands Across the Sand. 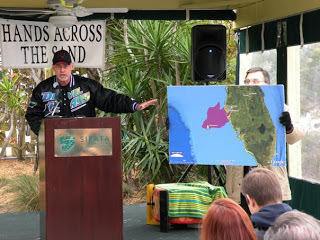 Sierra Club of Florida reports about 10,000 people participated. SkyTruth’s work related to last year’s oil spill in the Timor Sea off Australia made an appearance, in the form of a poster-sized map superimposing the Australia oil slicks on the Gulf Coast of Florida for scale. This was presented at a news conference hosted by a major coastal resort. Our work is intended to communicate just how much ocean was affected by the 10-week-long Montara oil spill, and what a similar spill could impact if it were to happen in US waters. See the latest maps in our gallery.